The so-called Islamic world is in crisis because many see enemies all over the place, be it democracy, Westernization, liberalism, socialism, and so forth. While alternative faiths are frowned upon, therefore, Christian and Buddhist missionaries must be aware because merely talking about your faith can mean either prison or death in nations like Saudi Arabia. Yet the real threat to Muslims and minority Muslim groups within various different nations is their fellow co-religionists, so why are outsiders hated so much when the real threat is Islam itself? After all, since 1970 approximately 5 million Muslims have been killed by fellow Muslims, however, one mention of Israel, and we hear about the Muslim unity card. However, the real “Muslim unity card” is a non-starter and this applies to the very foundations of Islam itself because the majority of early Muslim caliphs were killed by Muslims. Therefore, the current situation is similar to the past because it is based on internal tensions and mutual hatreds which run deep. The Kurds are a prime example because the majority of Kurdish people follow the Islamic faith, most are Sunni. Despite this, the Kurds, irrespective if Sunni or Shia, face persecution in modern day Iran, Iraq, Syria, and Turkey. 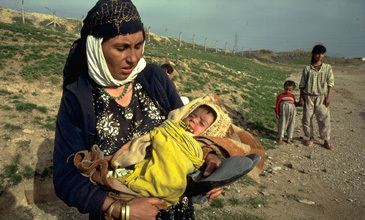 The Kurds, ironically, have much greater freedoms in mainly Christian Armenia where a minority reside or throughout the European Union where many have fled because of persecution in the Middle East. Therefore, the Kurds, the biggest stateless people in the world are marginalized and persecuted by fellow Muslims throughout the Middle East where they reside. Yet Muslims in the Middle East often speak-out for the Palestinian cause, however, the very same people often remain silent about the Kurdish cause. Therefore, it is clear that double standards are at play and Israel is a very easy scapegoat. After all, look at recent history and the reality of the modern world. For since 1970 at least 5 million Muslims have been killed by their co-religionists on the grounds of Sunni-Shia divisions, ethnic tensions, political tensions, and other issues. This applies to the Iran-Iraq war; the persecution of African Muslims in Darfur by the Arab Muslim dominated government in Khartoum; Kurdish persecution in Iran, Iraq, and Turkey (deaths have been a lot lower in Syria but persecution does take place); Pakistan-Bangladesh war; Algeria, Somalia, Syria (1982); Tajikistan; Yemen; and other nations. Also, roughly 150,000 Shia Muslims have been killed in Afghanistan, Iraq, and Pakistan, by Sunni Islamic fanatics. Despite this reality we have world leaders like President Obama of America appealing to the so-called Muslim world for a fresh start. Yet surely an internal fresh start is needed first, however, it seems most unlikely because the spiral of hatred runs very deep. Therefore, do Shia Muslims in America, France, Japan, South Korea, the United Kingdom, and other mainly non-Muslim nations reside in fear? Of course the answer is no. Yet Shia Muslims have been targeted in Afghanistan, Iraq, Pakistan, and other nations, by Sunni Islamic zealots. Meanwhile in Saudi Arabia it is clear that Shia Muslims are second-class citizens because the Sunni elite do not believe in religious equality. Then if we look at one Muslim branch, the Ahmadiyya’s, and the Bahai’s which is an offshoot from Islam (but an independent religion), it becomes apparent that internal Islamic hatred and persecution is strong. After all, the Bahai community in Iran and the Ahmadiyya community in Pakistan, suffer enormous persecution. Therefore, many Bahai’s and Ahmadiyya’s have fled both Iran and Pakistan respectively, but if either branches fled to Afghanistan or Saudi Arabia, or other conservative Muslim nations, then they would suffer persecution once more. Given this, many Bahai’s and Ahmadiyya’s have fled to mainly non-Muslim nations because they have much greater freedom. Then if we focus on al-Qaeda (al-Qaida) and Osama Bin Laden and fellow Sunni Islamic zealots, then we see a similar pattern. For when al-Qaeda emerged in Afghanistan they took their deadly sectarian ways with them and Shia Muslims were murdered in cold blood by forces loyal to al-Qaeda. The same happened when al-Qaeda entered the Iraqi civil war because once more they slaughtered Shia Muslims at will and moderate Sunni Muslim leaders were also killed by Sunni Muslim fanatics who had been brainwashed. Given this, it is clear that Muslim unity is not only a sham but it is based on lies and sadly many elements within the mass media are ignoring this reality. Yet if Israel kills Palestinians in self-defence or during a military operation, then the usual mantra of Muslim brotherhood and Muslim persecution is raised. However, the real reality is very different because the vast majority of Muslims who are killed throughout the world are killed by their co-religionists. Therefore, the biggest persecutor of Muslims in the modern world is being done by their own co-religionists. At the same time, the deniers of democracy, religious freedom, female emancipation, and other important issues, are Muslim elites in many Muslim majority nations. Also, it is abundantly clear that America and other nations are not anti-Muslim. After all, you have had three wars in Europe involving Muslims and Orthodox Christians in recent times. This applies to Cyprus, Bosnia, and Kosovo (Serbia), and every time America supported Islam against Orthodox Christianity. Just like America supported Indonesia despite countless massacres of Timorese people in the 1970s, 1980s, and early 1990s. However, when the Arab dominated regime in Khartoum, Sudan, was killing millions of mainly African Christians and Animists in southern Sudan did mainly Muslim nations enter Sudan to stop the bloodshed. Of course they did not and many African slaves in Sudan were sold internally but the outcry was very silent in the so-called Muslim world. Despite everything, the President of America, Obama, is offering an “olive branch” but surely it should be the other way around. For in America people have the right to follow any religion they want or to have no religion. Yet in the land of Mecca and Medina (Saudi Arabia) you are not allowed to have one single Christian church, Buddhist temple, Hindu temple, or any other non-Muslim place of worship. Therefore, what is the real agenda? Is it that Saudi Arabia can do whatever it likes because of their massive amounts of oil reserves? For this nation is spreading radical Sunni Islam to Afghanistan, Chechnya (Russian Federation), Iraq, Pakistan, Somalia, and many other nations, without any fear. Or is it that political correctness means we have to be pro-Islamic to show how nice we are, therefore, minority Muslim branches, Christians and other non-Muslims are allowed to be “lambs to the slaughter of Islam?” Or is it a mixture of both or collective amnesia? Maybe I will always be in lament because Israel is the easy scapegoat and of course many Muslims appear to believe that they are victims. However, the real truth couldn’t be further away because the biggest threat to minority Muslim groups and to the freedom of Muslims, is being done in the name of Islam by either radical zealots or despotic rulers who invoke Sharia Islamic law in order to preserve their respective power bases. The mass media should take a long look at itself and start to question the so-called House of Islam, Arab unity, Muslim brotherhood, and so forth. For Arab unity ignores both Arab disunity and the many non-Arab groups who reside in Arab dominated nations. While the House of Islam was divided within a short time of the death of Mohammed and Muslim brotherhood is based on unreality.